^ a b Smale, M.J. (2005年). "Triaenodon obesus". IUCN Red List of Threatened Species. Version 2008. International Union for Conservation of Nature. Retrieved 2009年7月15日. ^ a b c d e f g h i j k l m Compagno, L.J.V. (1984). Sharks of the World: An Annotated and Illustrated Catalogue of Shark Species Known to Date. Rome: Food and Agricultural Organization. pp. 535–538. ISBN 92-5-101384-5. ^ Randall, J.E., Allen, G.R. and Steene, R.C. (1997). Fishes of the Great Barrier Reef and Coral Sea. University of Hawaii Press. p. 22. ISBN 0-8248-1895-4. ^ a b Froese, Rainer and Pauly, Daniel, eds. (2009). "Triaenodon obesus" in FishBase. July 2009 version. ^ a b c d e f g h i j k l m n Randall, J.E. (1977). “Contribution to the Biology of the Whitetip Reef Shark (Triaenodon obesus)”. Pacific Science 31 (2): 143–164. ^ a b Carrier, J.C., J.A. Musick and M.R. Heithaus (2004). Biology of Sharks and Their Relatives. CRC Press. pp. 52, 502. ISBN 0-8493-1514-X. ^ Naylor, G.J. ; Caira, J.N. ; Jensen, K.; Rosana, K.A. ; Straube, N.; Lakner, C. (2012). “Elasmobranch phylogeny: A mitochondrial estimate based on 595 species”. In Carrier, J.C.; Musick, J.A. ; Heithaus, M.R., eds. The Biology of Sharks and Their Relatives (second ed.). CRC Press. pp. 31–57. ISBN 1-4398-3924-7. http://prosper.cofc.edu/~sharkevolution/pdfs/Naylor_et_al_Carrier%20Chapter%202.pdf. ^ a b Whitney, N.M.; Robbins, W.D. ; Schultz, J.K.; Bowen, B.W. ; Holland, K.N. (2012). “Oceanic dispersal in a sedentary reef shark (Triaenodon obesus): genetic evidence for extensive connectivity without a pelagic larval stage”. Journal of Biogeography 39 (6): 1144–1156. doi:10.1111/j.1365-2699.2011.02660.x. ^ a b c d e Hobson, E.S. (1963). “Feeding Behavior in Three Species of Sharks”. Pacific Science 17: 171–194. ^ a b c d Martin, R.A. Coral Reefs: Whitetip Reef Shark. ReefQuest Centre for Shark Research. Retrieved on August 7, 2009. 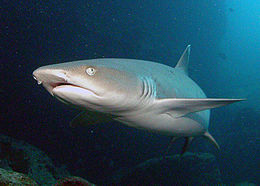 ^ Bester, C. Biological Profiles: Whitetip Reef Shark. Florida Museum of Natural History Ichthyology Department. Retrieved on August 7, 2009. ^ Coetzee, M., N.J. Smit, A.S. Grutter and A.J. Davies (June 2008). “A new gnathiid (Crustacea: Isopoda) parasitizing two species of requiem sharks from Lizard Island, Great Barrier Reef, Australia”. The Journal of Parasitology 94 (3): 608–615. doi:10.1645/ge-1391r.1. ^ Whitney, N.M. and P.J. Motta (June 2008). “Cleaner host posing behavior of whitetip reef sharks (Triaenodon obesus) in a swarm of hyperiid amphipods”. Coral Reefs 27 (2): 363. doi:10.1007/s00338-007-0345-4. ^ Nelson, D.R. and R.H. Johnson. (1970). Acoustic studies on sharks: Rangiroa Atoll, July 1969. ONR Technical Report 2, No. N00014-68-C-0138. ^ Yano, K., H. Mori, K. Minamikawa, S. Ueno, S. Uchida, K. Nagai, M. Toda and M. Masuda (June 2000). “Behavioral response of sharks to electric stimulation”. Bulletin of Seikai National Fisheries Research Institute 78: 13–30. ^ Ferrari, A. and A. Ferrari (2002). Sharks. Firefly Books. pp. 186–187. ISBN 1-55209-629-7. ^ Bight, M. (2000). The Private Life of Sharks: The Truth Behind the Myth. Stackpole Books. pp. 123–124. ISBN 0-8117-2875-7. ^ a b c d e Robbins, W.D. (2006). Abundance, demography and population structure of the grey reef shark (Carcharhinus amblyrhynchos) and the white tip reef shark (Triaenodon obesus) (Fam. Charcharhinidae). PhD thesis, James Cook University. ^ Johnson, R.H.; Nelson (1978). “Copulation and possible olfaction-mediated pair formation in two species of carcharhinid sharks”. Copeia 1978 (3): 539–542. doi:10.2307/1443626. ^ Schaller, P. (2006). 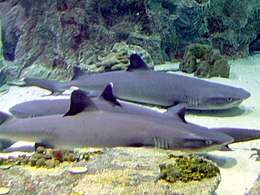 “Husbandry and reproduction of Whitetip reef sharks Triaenodon obesus at Steinhart Aquarium, San Francisco”. International Zoo Yearbook 40 (1): 232–240. doi:10.1111/j.1748-1090.2006.00232.x. ^ a b Fowler, S.L., R.D. Cavanagh, M. Camhi, G.H. Burgess, G.M. Cailliet, S.V. Fordham, C.A. Simpfendorfer, and J.A. Musick (2005). Sharks, Rays and Chimaeras: The Status of the Chondrichthyan Fishes. International Union for Conservation of Nature and Natural Resources. p. 314. ISBN 2-8317-0700-5. ^ Holtcamp, W. (July–August 2009). “Lone Parents: Parthenogenesis in Sharks”. BioScience 59 (7): 546–550. doi:10.1525/bio.2009.59.7.3. ^ ISAF Statistics on Attacking Species of Shark. International Shark Attack File, Florida Museum of Natural History, University of Florida. Retrieved on August 7, 2009. ^ Taylor, L.R. (1993). Sharks of Hawaii: Their Biology and Cultural Significance. University of Hawaii Press. pp. 20–21. ISBN 0-8248-1562-9.